Designed in 1966, JL 79 and it’s companion armchair JL 64 followed 12 months after the successful launch of JL 62 and JL 78. Chairs 79 and 64 demonstrates the skills of the Millers workshop to the full with their intricate construction of horizontal and rails and three vertical splats in the back providing excellent support to the sitter. construction of the strong mortice joints with interlocking tenons at each corner of the seat, alleviates the need for additional stretchers. This detail gives Møllers chairs a light elegant appearance and is particularly true of JL 79 and JL 64. 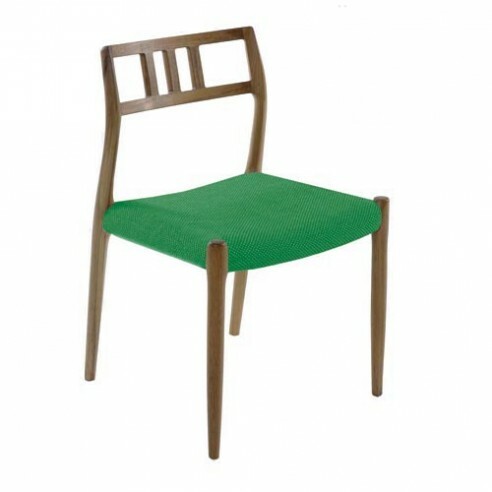 Like the majority Møller chairs the seat can be in woven paper cord of upholstered in a wide range of fabrics or leathers.